Mid-Nineteenth-Century Scientists collects together the significant biographies of eight English scientists, namely, Charles Babbage, Charles Darwin, James Prescott Joule, Hugh Powell, Joseph Lister, and William Henry Perkin. This book covers a wide range of topics in mathematics, biology, physics, and chemistry. Organized into six chapters, this book begins with an overview of the Charles Babbage's first idea on calculating tables by machinery to eliminate as far as possible any human actions in the process of calculation. 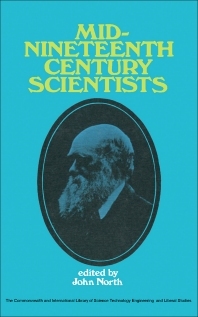 This text then presents a biography of Charles Darwin, with emphasis on his contributions to science through his theory of the evolution of species. Other chapters consider James Joule's determination of the mechanical equivalent of heat by means of a paddle-wheel rotating in water. This book discusses as well Joseph Lister's greatest achievement in improving surgery. The final chapter deals with William Henry Perkin's empirical approach to synthesis that led him to his discovery of mauveine. This book is a valuable resource for scientists, teachers, and students.